Dr Georgina Such completed her PhD in 2006 from the University of New South Wales. After her PhD, Dr Such commenced postdoctoral work in the Nanostructured Interfaces and Materials Science (NIMS) group headed by Professor Frank Caruso. In 2013, she commenced a Future Fellowship in the School of Chemistry, The University of Melbourne, enabling her to start her own research group in the area of stimuli-responsive materials. Dr Such is now a senior lecturer at the University of Melbourne. Dr Such has authored 68 peer-reviewed publications including 3 book chapters. 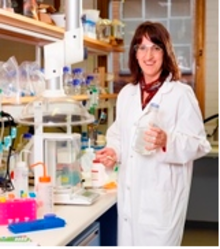 Her work has been recognized with a number of awards including the David Sangster Polymer Science Achievement Award in 2018, the Grimwade Prize for Industrial Chemistry in 2017 and the L’Oreal Women in Science Fellowship in 2011. Her research interests include polymer synthesis, self-assembly and stimuli-responsive materials.